The first records we have read about schooling in Loddon mention the school in what is now called The Priest's room in the Holy Trinity Church in 1781. The nineteenth century saw considerable changes, including a rise in the population and consequently in the number of children. It also saw a rise in the popularity of nonconformist religions and a certain amount of competition in the provision of education for the young. As well as the established schools there were, it seems, several private schools in the vollage at one time or another. The 1851/61/71 census figures show a private school on the east side of Bridge Street where Mr David Hart, a trustee of the Methodist Church, and his wife educated up to 9 girls as well as their own son. By 1856 it was decided to build a new school in Loddon for 180 pupils on the site of the old guildhall on Church Plain. Two thirds of the cost was to come from the Town Estates, which was essentially, revenue derived from the renting of Town Farm and other town lands. The rest came from public subscription and an appeal was set up to raise money from the community. The eventual result was a flint faced imitation Gothic building which is still used today as the Loddon Branch Library where the Before Your Time photograph archive and LALA project is housed. 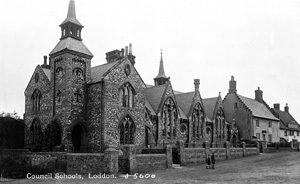 The school term apparently started in 1858 (although the building does not appear to have been finished until 1859), when 99 children from 3-13 years old were entered. Many would not stay at school long, nor attend regularly as the need to supplement the family income when possible could not be ignored. Many children had a long walk to school, which could be impossible in bad weather. This building was used as a school right up until 1969 and the picture in our online archive shows a class of 8 year olds in 1956/57, inlcuding one of the Before Your Time authors.